Belle découverte d'Oxford bien qu'un peu succincte. Çà donne envie d'y revenir pour découvrir d'avantage de belles choses. Harry Potter, super. Les horaires ont été respectés, les trajets rapides et les guides aimables. Le seul regret est qu'il n'y ait pas une "version française" car, parlant mal anglais, nous avons raté pas mal de commentaires intéressants du guide. We booked the Making of Harry Potter and Oxford Day Trip from London simply as a part of our "bucket list", but it turned out to be more than expected. The Viator crew was prompt, efficient and thoroughly professional. The tour leader was very knowledgeable and provided a smooth experience. We worth the money, especially if you have time limitations and would like to see a lot in a short time. Great day! Myself and my 3 kids visited Warner Bros studios as part of a tour we had booked, my kids love Harry Potter they grew up with the movies and loved it ever since. The experience is simply breathtaking it’s more than what I expected and you feel your in film it’s so lifelike and real. We had the Beerbutter and Ice cream but for parents with kids like me take a packed lunch as food prices are simply outrageous and unaffordable for many families that is the only downside to this trip. We went away full of wonderful memories that will last us a lifetime, my advice if you can afford to go then please do your kids will thank you for it. The people for this tour was very helpful. OUr tour guide Rob was very helpful. He worked with us to meet us at the location since we arrived that day and we could not meet them at the meeting point. However he was always on communication until we to the warner studios to start the tour. Once the tour was over he took his time to take us the place where we could get a cab to take us to our hotel to check in. We had a Great time in Oxford. Our guide had terrific historical and modern information about the city and school and tied it in with Harry Potter sites as well. The Harry Potter studio was a great self guided tour of the sets, costumes, and making of the movie. Our tour guide that never told us his name, was not the best. He would neglect to inform us what time and where we had to meet unless we asked him, but then he wouldn't tell everyone else. If you want a purely Harry Potter experience like we did, dont expect that with the Oxford part. The guide also did not know very much about Harry Potter. Although Oxford was nice, it wasnt as Harry potter filled experience as we expected. But the Warner Bros experience was great. We had both done it before but it had changed slightly which was exciting! 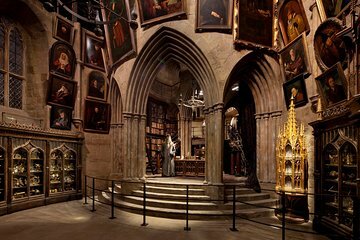 Overall, I would suggest perhaps only doing the Harry Potter studios, especially if you have children as I imagine they will get bored. We vonden de stad Oxford heel erg mooi, de stadswandeling was ook zinvol. Er werd veel verteld, maar we hadden verwacht dat we ook gebouwen en locaties konden bezoeken die gerelateerd waren aan Harry Potter en dat viel ons wat tegen. Na de toer had je 2 uur de tijd om dit zelf te bezoeken maar dat paste niet echt met rondleidingen en tijd. Bovendien kwamen er dan nog eens extra kosten bij. De studio vonden we geweldig en dit was ook prima geregeld. Genoeg te zien en te doen. Wow, just wow! By far the best tour of Harry Potter ever. And, we got to see Oxford, which is impressive. its also super impressive to learn how this city influenced the story of Harry Potter. Definitely a must see for any fans.